Why read about a book that was published in 1948 and a text book at that? For two reasons; first It wasn’t just a textbook…. it was the economic textbook for most of the world for over half a century, the bestselling economic textbook of all times. Over four million have been sold; 19 different editions in 41 languages. It defined what the world came to believe was economics. It was my textbook in the 1950’s and then as if to underscore the point about twenty years ago I took a taxi in New York. 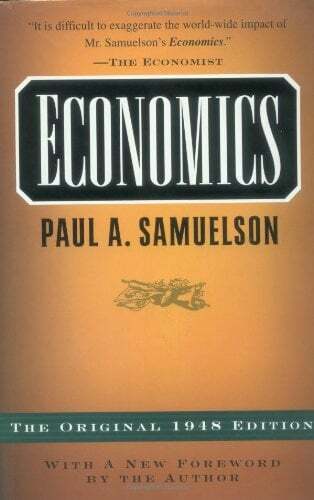 The driver was Russian and had studied economics at Moscow University; his textbook too was Samuelson’s, that’s how pervasive it became. It was probably the first book to explain the way society had evolved from the centuries in which society was driven by some mix of tradition, decency, religious values and the church to the new world driven by something called market forces. And the more important reason to look back at this textbook is because today we can see that many of Samuelson’s assumptions were wrong and as time passes those errors work increasingly against us. Paul Samuelson (1915 – 2009) was born to Polish immigrants in Gary Indiana, went to the University of Chicago during the depression and then was able to go to Harvard for a PHD. You can read more about him in the first chapter of my book. He saw economics as a tool to do many things; he wanted to fix the economic cycle of boom and bust and to enhance the system to provide more equal opportunity. He was driven by first-generation American zeal to outdo the Russians by having a better economic system than the cold war Russian communists. His book assumed a near perfect free enterprise system which built easily on Adam Smith’s observations from 1776. To recap, Smith had said that by everyone pursuing their own self-interest the free market system would provide goods and services seamlessly and fairly, as if guided by an invisible hand. Samuelson’s competitive capitalism was a neutral system that would naturally lead to a fair society. If some people were getting too rich, others would go into that business and competition would level the playing field. It would do so with limited government interference. He accepted that the state had some role in protecting the system as the British Economist John Maynard Keynes (1883 to 1946) had advised. But the dominant message was that competition was all we needed. Those views dominated for decades and are so well accepted that we now have trouble understanding why the rich are getting so much richer; that isn’t supposed to happen. It turns out that the system does not lead to fairness but leads, as we are seeing, to the rich getting richer and the poor poorer. Fewer and fewer businesses control more and more of the world economy as competition defeats itself. Marx had pointed that out in his 1885 book on Capital. Samuelson was aware of Marx but dismissed his writing as ‘baleful prophesies.’ About six of the over seven hundred pages in Samuelson’s book are about Marx but missing is recognition of the wisdom that Marx provided. Consequently, the world has evolved as Marx foretold but Samuelson didn’t. In 1970 Paul was the second person to receive what is commonly called the Nobel Prize for Economics and that requires some comment. Alfred Nobel never created a prize for economics and for good reason. Economics is not a science. Science builds discovery on discovery to redefine a world view that has allowed us to progress into the heart of atoms and to the edge of the universe. The prize in medicine has recognized mankind’s gains in conquering malaria, diabetes and more. Economics has done nothing similar; there is not even a common view among economists as to how the economy works. More accurately the prize given today is the Sveriges Riksbank Prize in Economic Sciences in Memory of Alfred Nobel. It’s sponsored by the National Bank of Sweden (the Sveriges Riksbank) and of the 81 awards given, 28 have been to people at the University of Chicago where the economics department has been a cult of neoliberalism, these are the missionaries of the creed of unregulated markets and globalization theories that make the rich richer and the rest poorer. Samuelson was more decent than that; he believed in progressive taxation, taxing based the ability to pay. He didn’t dwell much on money nor its creation. Huge omissions, nor did he differentiate between money earned by working and money received on investments. As a result the strong argument that ‘unearned income’ should be taxed higher than money worked for never survived. His dominant legacy was the idea that economics is neutral… supply and demand should result in wages going up in low income countries and down in high… unimpeded competition should naturally results in steady movement towards neutral; just trust it. As the rich get inexorably richer we see how wrong he was but the influence of his book over decades has created a mythology about markets that is hard to overcome.